Here’s a yummy do-it-yourself trend that you and your guests can really sink your teeth into… homemade cupcakes at your wedding reception. Adorable (and chic) little cupcake shops are popping up everywhere, and for good reason. Cupcakes are a little bit of heaven in every bite – and just the right size so your guests can indulge in more than one flavor. Cupcake towers and display tables are common at wedding receptions these days, and the best part is that this DIY option can save you lots of dough when budgeting your catering needs. 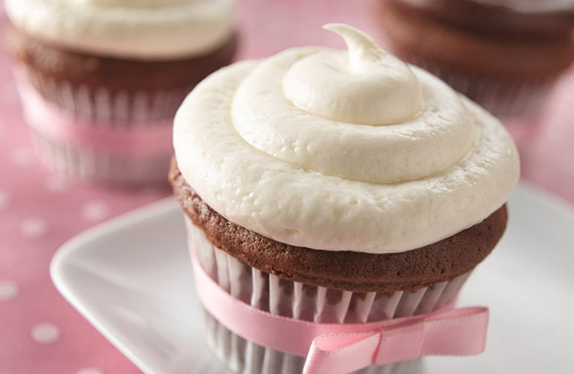 Here’s a little sweet inspiration for baking and displaying cupcakes at your wedding or rehearsal dinner. After you find the perfect cupcake recipes (more on those later) the fun part is deciding how to embellish your sweet treats. I love cupcake wrappers and think they give you an easy way to add style to your wedding decor. Cupcake wrappers are super simple to assemble and come in loads of colors and designs. It’s easy to find wrappers online or at your local craft store. On-line options including sites such as FancyFlours, Bella Cupcake Couture and Etsy where you can custom order wrappers to match your wedding colors. Other options include monogramming and personalized designs. If you have the time and energy, a real do-it-yourself project can be to design and create the wrappers yourself. Click here for instructions. Now for more fun… how will you display your lovely little cakes? 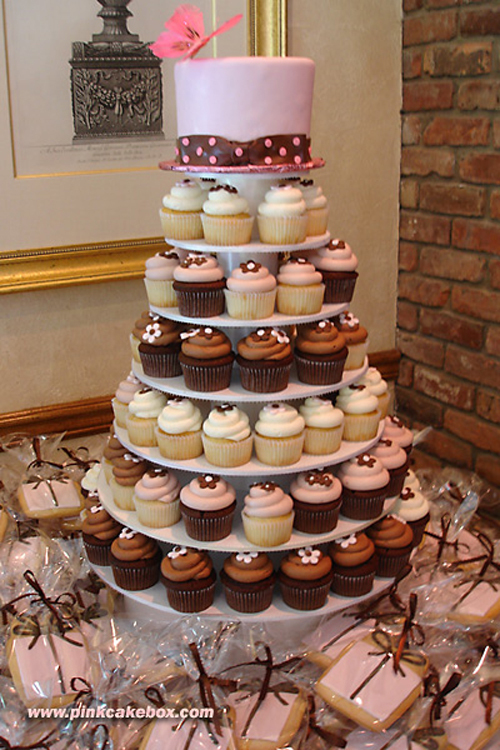 One choice is to simply arrange your decorated cupcakes on cake stands of varying heights. Have you seen cake stand wrappers (below, right)? They’re a nice option for dressing up your display table. I love the square box display (below, left). It has all the sophistication and style of a traditional wedding cake. 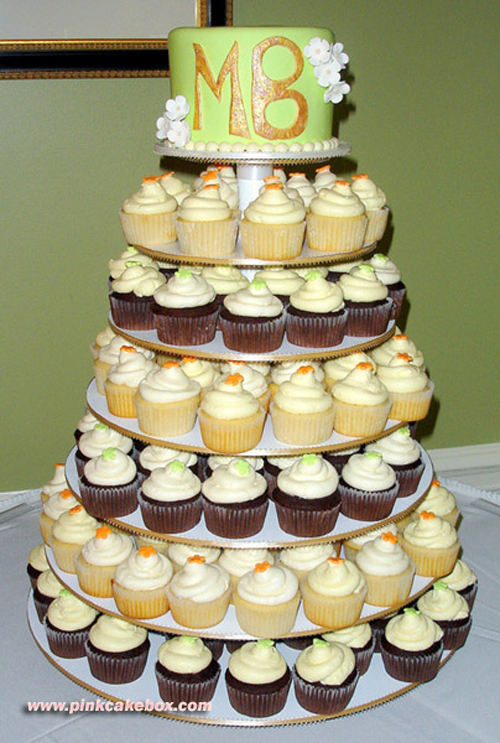 Some brides like to include a small cake as a “topper” for the tiered cupcake display. This is a nice option for couples who want to have the traditional cake cutting ceremony. Look at the two cupcake towers below… the color and funky design make them so much fun. You can achieve this look by having a professional baker create the small cake to go on top and bake your own cupcakes to go below. This is an easy and economical alternative to a traditional wedding cake. Of course if you are thinking about offering cupcakes as an alternative to regular cake at your wedding, you’ll have to do lots of taste testing as well! 🙂 There are lots of websites out there that offer yummy cupcake recipes, so finding that perfect flavor won’t be hard. Here are two of my favorite favors: Chocolate Marshmallow and Pink Lemonade. Visit Homemade by Holman for these and other delicious recipes. Enjoy!